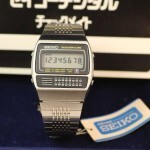 Seiko’s second calculator watch, a beautiful stainless steel model from 1979. Check out the tiny keypad beneath the display. 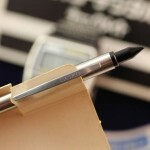 You’ll need stylus, pen/pencil or very tiny fingers to use it. The grille to the left is for the alarm. 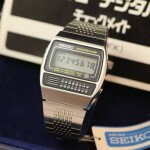 The LCD shows time, day of week and date. A light illuminates the display for calculating in stealth during night missions or during blackouts. 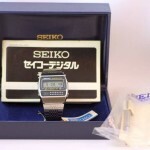 Made in Japan, this one includes the original box, hang tag, signed stylus and instruction manual. 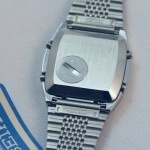 Brand new battery, all functions are working (calculator, light, alarm and time functions). The display is perfect, no discoloration or fading. 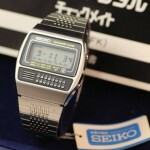 hey great Seiko calculator watch .I have a1977 Seiko quartz digital . It was a HS graduation present from parents . You might be able to help me . I need a battery ,…however…the battery was removed and I don’t have it to match. Mine has a little round door on the back just like yours in the picture. What is the # on you battery and it might be the same as mine. Any help would be appreciated. thanks Craig.